Fire has always been a hazard, especially in a densely populated seaport with its many industries and stocks of flammable cargoes. Mystic had several serious shipyard and downtown fires in the mid-1800s, which resulted in the formation of volunteer fire companies. In a shipbuilding community, the fire engine might also be put to use “watering” new vessels to swell their seams before they were launched. 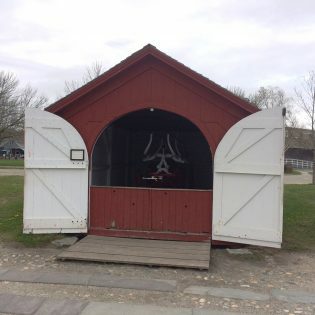 Block Island Fire Engine #1 was built by Gleason & Bailey in the 1850s and operated by volunteer firemen to protect the wooden homes, businesses, and hotels of that island community. The pump-break mechanism on the engine could develop enough pressure to throw a stream of water 100 feet. Pulled by hand, this pumper would be accompanied by a hose cart with two 500-foot hoses.